Zambia boast some of the most fantastic waterways in Africa. In the middle of April, people from far and wide come to the country to attend the Kuomboka Festival of the Lozi people. Every year when the Zambezi River floods the plains, it creates a deep shallow river. 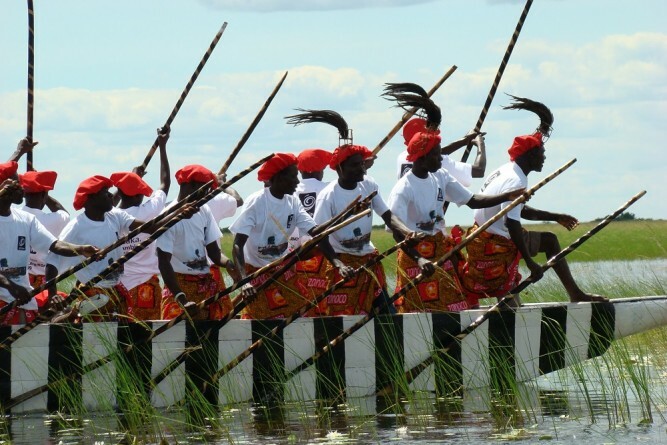 The Lozi people move to higher ground during this period and the Kuomboka is seen as a ceremonial event to mark it. Traditionally the King of the Lozi, his family and his entourage a ferried on a huge black-and-white stripped barge with an elephant at the time of his marquee - a symbol of his power - to the rainy season palace during the festival. The festival is packed full with fun activities such as hearing the Royal Maoma drums and the boatmen sing old folktales. Posted on April 17, 2015 by Adamu Waziri and filed under African Culture, Fun Stuff and tagged african culture festival zambia.